Ouchy-wah-wah is what we like to say around here. Yikes. And is it crazy that I didn’t realize the damage until AFTER we finished our shopping trip? I mean, a half hour later and a mile more of riding happened and I was completely oblivious to the bleeding. I had inspected the scrape right after it happened, but I guess I missed that upper part. I blame my right eye, it’s useless. Of course now we are home and resting, and I cleaned up the wound and it hurts like the dickens. I’m pretty sure it was getting infected. Eeewww. I might wait until I’ve built up my core strength a bit more before attempting another ride. Gotta stay safe! Previous PostWhat is on my mindNext PostThe fruit go everywhere. 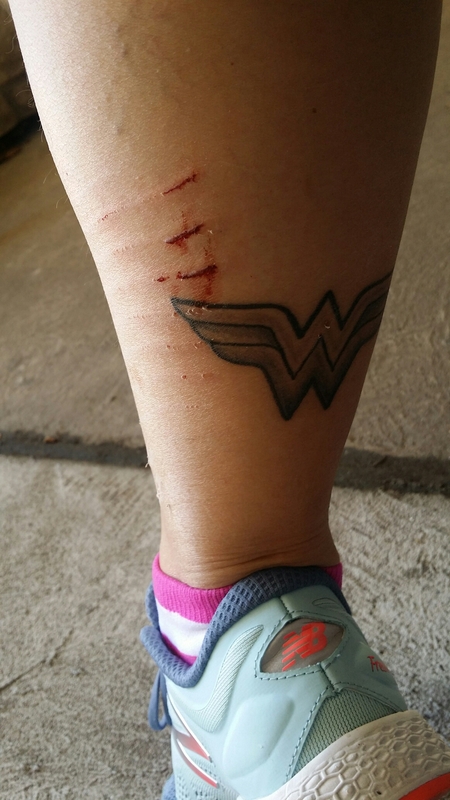 Personally, I think some good scar tissue goes well with the Wonder Woman tattoo. It adds a ‘toughness’ factor. Haha! You think? I found the placement interesting.